From humble beginnings in the mid 50’s Gyral is now in the enviable position of being universally recognised as the developer of the modern day air seeder; a pioneering innovation that has taken Gyral to a position of international recognition. The advent of precision farming technology is also just the sort of challenge that Gyral is looking for as it strives to develop “leading edge” tillage and seeding equipment for the 21st century. At Gyral we are proud of our rural heritage and our ability to listen to farmer’s needs and respond quickly to the ever changing environment in which they operate. We are committed to providing unrivalled levels of service to both farmers and their dealer network. Gyral Implements. Farming for the Future. The Ezi-Edger is capable of double edging pathways simultaneously. 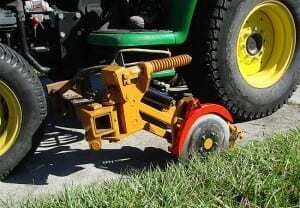 Either assembly can be easily removed and remounted on the other side of the tractor to enable the operator to edge previously inaccessible kerbing or pathway situations. The tension of the spring release jump action can be manually adjusted to suit your conditions. The pivoting arm design ensures the correct disc cutting angle is maintained at all times. 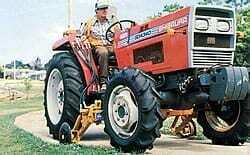 Good road clearance of 250mm for most tractor models is easily achieved. 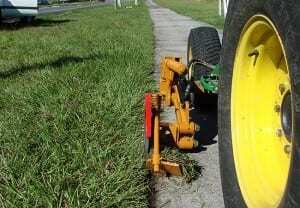 A rugged belly mounted tractor bracket is fabricated to suit double edging applications. The edger mounting beam is manufactured to suit your path width requirements. 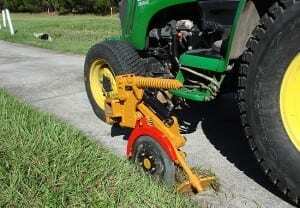 A side mounted tractor bracket and beam is used for single edger operations. Independent hydraulic control for each edger assembly gives the operator the flexibility for single or double edging at any point along the path way. Curved and winding pathway and kerbing is easily trimmed with this versatile equipment. Because of the flexibility of the unit, driver fatigue and skill becomes a lesser problem. A deviation of 150mm from the optimum driving line can be easily tolerated. The spring release action of the arm assembly ensures component parts are not stressed to the limit. Easily greased pivots on the swivel arm combined with hardened replaceable bushes in the pressure tongue ensures long life from all major components. The compact, robust mid mounted design ensures a positive response in following the pathway or kerb. Ground speeds of up to 8km per hour can be achieved under ideal working conditions. Pathways exits, driveways and tough soil conditions would necessitate a more moderate ground speed. The economic benefits of this edging system are such that you should consider the facts. The modest business frontage of Toowoomba based Gyral Implements Pty Ltd disguises one of Australia’s prominent engineering success stories. North American cropping farmers, for example, probably have no idea that equipment purchased from the Great Plains Manufacturing Co of Kansas was patented from the drawing boards located at Gyral’s Queensland Head Office or that Australian farmers from Western Australia to Queensland who have purchased Gason, Horwood Bagshaw, Shearer, Napier Grasslands or Simplicity are using equipment that is or has used Gyral’s Air Seeding concepts. Just how a family owned and managed company made the quantum leap from a relatively small Darling Downs equipment manufacturer to one which still sees royalties for its air seeder patents being honoured from all around the world make fascinating reading.